THE WORLD’S BEST didn’t rate that way. CBS: Without the Super Bowl as a lead-in, THE WORLD’S BEST fell sharply to a merely OK 1.0, down 0.2 from last Wednesday’s BIG BROTHER: CELEBRITY EDITION. The season finale of CRIMINAL MINDS was steady at 0.8. FOX: 24 HOURS TO HELL & BACK slipped 0.1 to 1.1, and THE MASKED SINGER dropped 0.4 to a still-big 2.2. 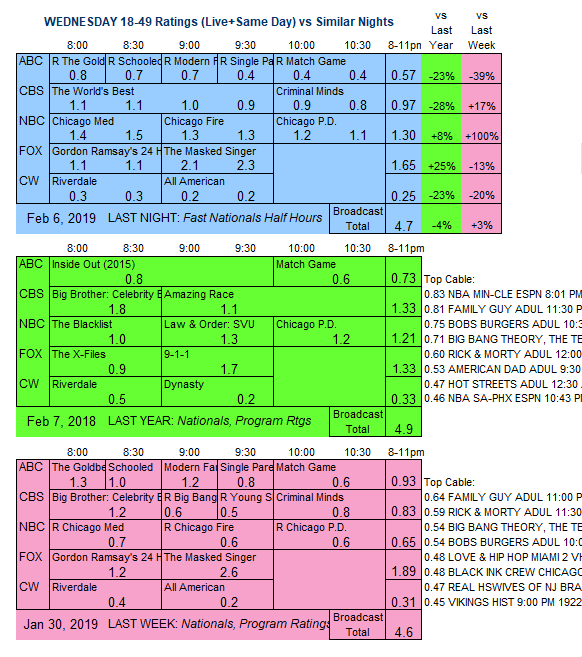 NBC: Returning from a rerun week, there were 0.1 bumps for CHICAGO MED (1.4), CHICAGO FIRE (1.3) and CHICAGO PD (1.2). 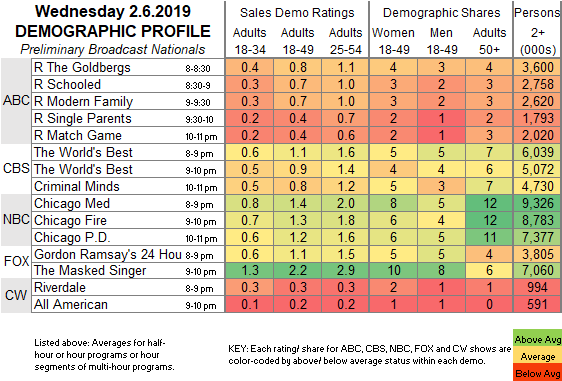 CW: RIVERDALE lost 0.1 to 0.3, and ALL AMERICAN remained at 0.2. Tonight’s BIG BROTHER: CELEBRITY EDITION moves to the 9PM hour.